Excessive sunbathing is linked with all sorts of health risks in humans, but the Western Boxelder bugs of British Columbia use sunlight to ward of illness. It's all part of one of the more bizarre biological processes we've yet encountered. These bugs will often leave their shelters and hang out in large groups in sunlit areas, at which point they begin to release strong-smelling compounds known as monoterpenes. Despite the seemingly social nature of the gathering, the bugs aren't releasing the chemicals to communicate or to set the stage for mating. Instead, the monoterpenes work to kill any germs or pathogens that might have accumulated on their bodies during their time in their shelters. "Prophylactic sunbathing defends these bugs against pathogens that they encounter in their shelters. "If they are converting the sun's solar energy to fuel chemical work, without the aid of microbial symbionts — organisms that live together with a host, often to their mutual benefit — we would consider this a highly remarkable feat in the animal world." 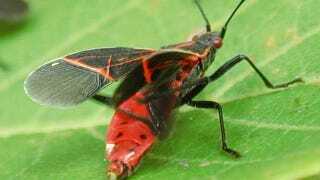 It's entirely possible that other insects also know how to tap into the sun's rays to get the most out of their natural chemical defenses, but for now it's only been observed in the Western Boxelder bugs. Original paper at Entomologia Experimentalis et Applicata. Image via Simon Fraser University on Flickr.